SHANNONWATCH HAS CALLED on Transport Minister Shane Ross to explain why a plane operating on behalf of the US military was permitted to fly from Shannon Airport to Incirlik Air Base in southern Turkey and back on Friday, 30 December. Shannonwatch campaigns for the use of Shannon Airport by US military to end. The organisation said the Turkish air base, which is located close to the Syrian border, is used by the US to launch air and drone strikes and to store part of its nuclear arsenal. As such, Shannonwatch claimed any involvement in the delivery of military cargo or passengers to Incirlik is “a breach of Irish neutrality”. The organisation said the plane, a Miami Air International Boeing 737, arrived at Shannon on the date in question at 1pm and took off less than two hours later. They said it spent a similar length of time at the military airbase in Turkey before returning to Shannon at 4am the following morning. “As the minister responsible for the granting of permits to take weapons and munitions through Irish airports, does Minister Ross have information about what was on board the Miami Air plane?,” John Lannon of Shannonwatch asked in a statement. [Ross] has expressed concerns in the past about Ireland’s lack of neutrality, so why does he allow an aircraft flying to and from a major Nato airbase like Incirlik to land at Shannon, presumably for refuelling? “If the Miami Air plane had weapons or other dangerous cargo on board it should not have been allowed to park at the terminal building where it presented a safety risk to people using the airport and to workers.” Lannon added. 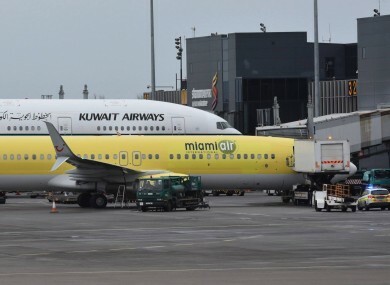 A spokesperson from the Department of Transport told TheJournal.ie: “Miami Air International did not notify or seek permission from the Department of Transport, Tourism and Sport in relation to this flight. The landing at Shannon Airport was a technical stop for refuelling purposes. Civil aircraft are not normally required to notify or seek permission for overflights of Ireland or technical stops at Irish airports. Permission is required when munitions of war are on board. “Ireland’s procedures in relation to such flights, including in relation to munitions of war, are outlined in detail in a standard international civil aviation document known as the Integrated Aeronautical Information Package, which is published on the Irish Aviation Authority’s website (and can be read here). The department has now contacted Miami Air International to enquire as to all the circumstances surrounding this flight. Shannonwatch said the presence of the plane at Shannon Airport “also raises questions for the Ministers for Justice and Foreign Affairs”. A spokesperson said the Department of Justice was “not in the position to comment” on the issue, while the Department of Foreign Affairs had not replied to a request for comment at the time of publication. In September, TD Clare Daly asked Foreign Affairs Minister Charlie Flanagan about US military planes using Shannon Airport. At the time, Flanagan told the Dáil: “All applications for US military aircraft to land in Shannon Airport in the period in question stated in each case that the flight met each of the conditions necessary, including that the flight did not form part of a military exercise. Email “Shannonwatch asks Shane Ross why 'plane on way to Nato air base' was allowed to stop in Ireland”. Feedback on “Shannonwatch asks Shane Ross why 'plane on way to Nato air base' was allowed to stop in Ireland”.